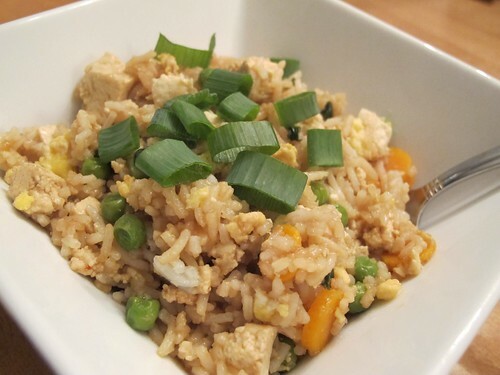 Tofu Fried Rice and a Cookbook Giveaway! I haven’t had time to meal plan. I haven’t had time to post. I’ve barely had time to shower (gross. TMI?) But I HAVE had time to make this DELICIOUS Tofu Fried Rice and hook you up! 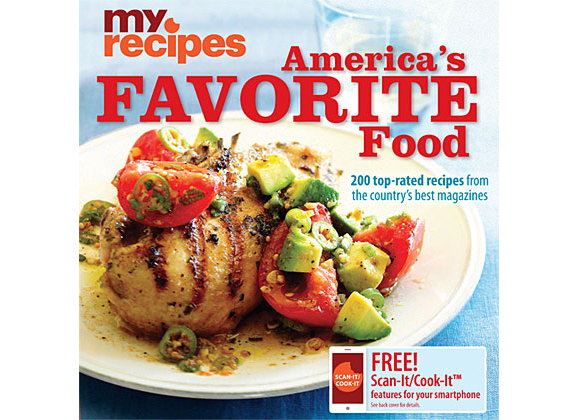 I’m hosting ANOTHER giveaway, and you can win a copy of America’s Favorite Food cookbook by MyRecipes. When I was flipping through the cookbook trying to figure out what to make first, I was already impressed by the design and the big text and photos. 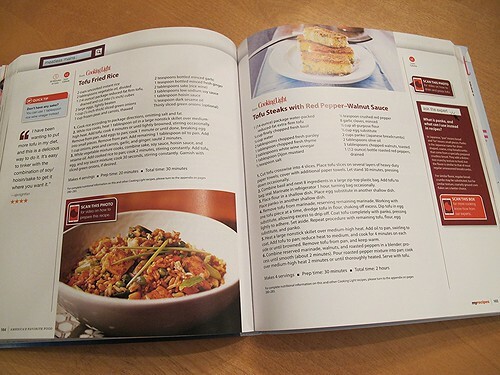 I hate getting a new cookbook only to find that the text is small, and that there are little to no photos of the food. Invisible watermarks in more than 130 images bring the recipes to life, delivering videos, bonus recipes, and other features directly to your smartphone. 1. Download and open the Digimarc Discover app on your smartphone. It’s free and available at the iTunes store for Apple devices and at the Google Play market for Android devices. 2. Position the phone 4 to 7 inches above any photo or box with a SCAN THIS label, as if you are about to take its picture. Use the phone’s camera flash if necessary. If you have access to a Wi-Fi connection, downloads will be faster. 3. Hold the phone steady for a second or two. The app will click and buzz when it recognizes the image and then begin downloading the described feature directly to your phone. Orange labels like this one identify boxes you can scan for bonus content. SO COOL. The only problem I had is that my phone didn’t support the Digimarc Discover app, so I had to use Dave’s phone. So, want to win a copy of America’s Favorite Food cookbook for your bookshelf? Leave a comment with your favorite recipe of all time. Scrambled eggs with ketchup? OK! (but gross) Coq au Vin? (I had to google the spelling of that). Whatever it is, leave it in a comment by Friday, December 14. And here’s the DELICIOUS recipe for Tofu Fried Rice. This one is totally a keeper! 2. While rice cooks, heat 1 tablespoon vegetable oil in a large nonstick skillet over medium-high heat. Add tofu; cook 4 minutes or until lightly browned, stirring occasionally. Remove from pan. Add eggs to pan; cook 1 minute or until done, breaking egg into small pieces. Remove from pan. Add 1 tablespoon vegetable oil to pan. Add 1 cup onions, peas and carrots, garlic, and ginger; sauté 2 minutes. 3. While vegetable mixture cooks, combine sake, soy sauce, hoisin sauce, and sesame oil. Add cooked rice to pan; cook 2 minutes, stirring constantly. Add tofu, egg, and soy sauce mixture; cook 30 seconds, stirring constantly. Garnish with sliced green onions, if desired. This sounds fabulous and simple and definitely like something I’d like to try, especially since fried rice is my favorite. Yum! Thanks for sharing, lady! 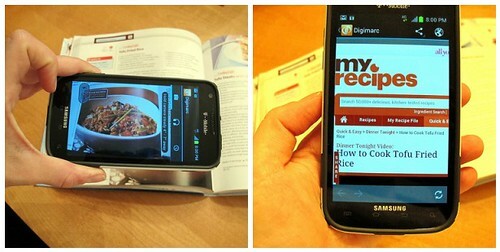 Interactive cookbook?! I love it! My all time favorite recipe is my mom’s homemade biscuits and gravy. And I’ve finally perfected it myself! My all time favorite recipe has to be my mom’s Chicken and Dumplings. So tasty and comforting!! Also, this cookbook looks awesome!! My husband makes a fantastic Pho noodle soup. Delicious!! How cool is this? One of my favorite recipes is from of all things Simple & Delicious. It’s a cream sauce/pasta/spinach/ham dish. Sounds not so great but oh my goodness, it’s divine! I can’t find the link to it since it’s a few years old now.